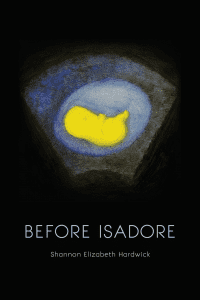 On the cover of Before Isadore, there is a luminous fetus. It is a yellow jelly bean with nubs, floating in its womb sack, and we are glimpsing its early gestation as if through the window of a first sonogram. The stunning cover art by Daniel Maidmen is the perfect introduction to Shannon Elizabeth Hardwick’s first full-length, itself an intimate portrait of a surprise conception, a splintering relationship, the decision to terminate, and all the emotional and psychological fallout of the abortion. The “pink line” of the pregnancy test is not met with joy, but rather “a great pain / expanding,” which readers soon discover in the loosely woven narrative arc of poems that follow. he sends bombs into the earth to feed his son” (12). The speaker continues, “I am radiating / / the thickness of some girl’s legs, his divorce / that already happened is happening in me” (12). The speaker’s marriage teeters, and it is in this environment she must choose. To keep or not to keep. What appears to be a large motivational factor in ending the pregnancy is protecting the unborn from this violence, from her father’s hands. 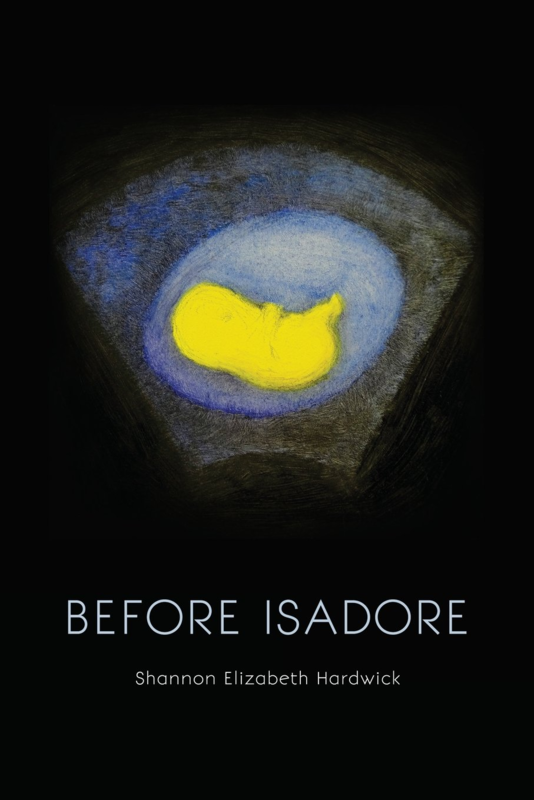 In another of several poems addressing Isadore, the title plays on the unborn’s name: “Isadore—There Is a Door Somewhere.” After the abortion and its subsequent nightmares of severed heads and red-robed monks and tantalus feasts, the speaker dreams of and imagines the threshold she might cross to connect with her daughter. Hardwick’s collection is divided into three sections. The first and last sections contain the narrative arc of the relationship, the abortion, the second child that the speaker does carry to term, and the eventual complete dissolution of the relationship with Michael. The middle section, however, is like the womb of the text itself in which a human gestates, each poem zooming in on a limb or organ. Titles in the womb-section include “How Eyes are Made,” “How Feet are Made,” “How Lungs are Made,” etc. However, there are several surprises: “How Grief is Made,” “How a Home is Made,” and “How a Woman is Made,” to name a few. Strategically placed, the section ends with “How an Abortion is Made” and “How a Marriage is Made.” The fetus that has metaphorically grown by accumulation throughout the section dissolves, finally, in the end. And readers see a foreshadowing of the marriage’s dissolution: “She wears, weaved, / herself a dress to greet them— how / they eat together but pray alone” (44). I don’t want to make the mistake of presuming that the speaker and poet are one and the same in this collection. Having said that, I find Hardwick to be a remarkably brave poet for honestly portraying human relationships in all their mess, the weighty decisions we face as a consequence, and how we forge onward, broken, broke into, haunted and prayerful.